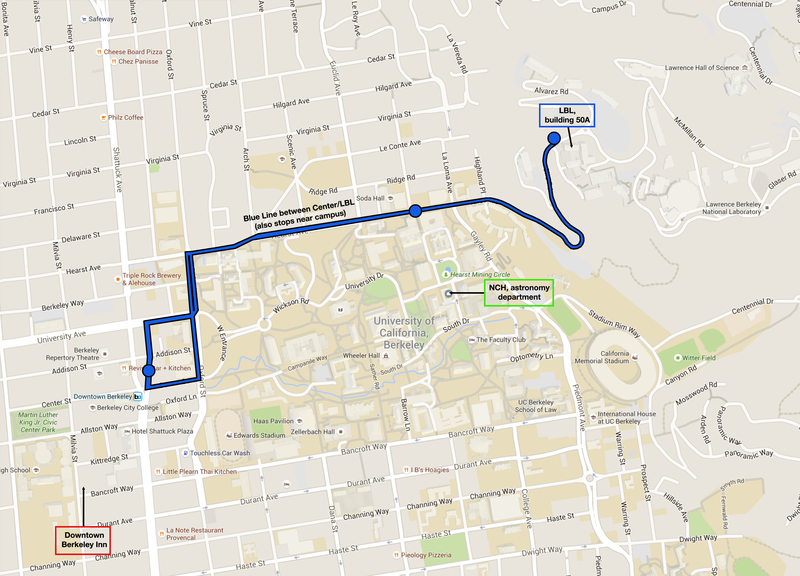 Campus meetings are in Campbell Hall and LeConte, near the Hearst Mining Circle and Campanile (Sather Tower) on the northeast side of campus. LBL meetings are usually in building 50, up the hill near the guest house. The Astronomy Department office is in Campbell Hall 501.
map showing bus route to LBL and Campbell hall, you can also walk straight up or down via parking lots and paths. if you visit longer than a day the rest of your time is wide open for you to arrange as you'd like. Currently we schedule pizza lunch right before the talk. If you are a speaker and have dietary restrictions, please let Joanne know. Usual Visitor Office: tbd in Campbell Hall -in the usual case, the staff in 501 Campbell (the main office) will set you up with everything you need (office/card key). Please go there when you get to Campbell Hall on Tuesday. People: Cosmology group directory and Astronomy Department Directory (unfortunately the astro link only takes you to faculty, and you have to go through researchers, postdocs, visiting scholars, grad students one by one, until it is fixed so that you can get everyone). There is significant overlap between the two lists. Speakers often spend part of their visit at LBL and often stay at the guest house up at LBL. To enter LBL you need a bus pass and your US driver's license or foreign passport. It is a short walk or you can take the LBL shuttle. The route on Hearst is here, but there are walking paths (south of the Greek theater, in the parking lot, to the parking lots above, and then to Blackberry canyon gate) which are shorter. San Francisco airport ( SFO) is also nearby. You generally do not need to rent a car, but if you are taking a shuttle or taxi, allow time for traffic. The BART now goes to both SFO airport and OAK airports. From OAK there is a BART shuttle train (every 5 min as of 11/2014) connecting to a longer line. From SFO it is a stop on the full longer line. You want to get to the downtown Berkeley stop (generally a train going to Richmond will do this, some days/times there is no direct train and announcements will tell you which trains have quick transfers, usually a Pittsburgh-Bay Point train will then be the one you want). Bayporter Airport Shuttles: 1-415-467-1800 to/from both OAK and SFO, www.bayporter.com, reservations online. To get picked up from the airport, call them when your bags have arrived and they'll give you a reservation and tell you where to wait. If you are arriving at an unusual hour it may be good to verify with them that they'll be there at that time. To get a ride to the airport, try to call at least a day in advance. Please note--if you are a Tuesday speaker, your lodging arrangements should be made by Troy Cortez, as there are special LBL rates at many of these places. The phone numbers are in case you need information from the hotel, not to make your reservations. There may be difficulties reimbursing you if you make lodging arrangements on your own without coordinating either with Troy or Joanne. up at LBNL, default place for lodging. 510-495-8000. Return to LBL Home Page.